Our colors will be soft, romantic colors: champagne, blush pink, dusty rose, peach and light coral/salmon. I really love big, soft, fluffy flowers. Peonies are my favorite, but they won't be in season in July, so I'm going for lookalikes. I LOVE big, open garden roses that kind of resemble peonies. These are the garden roses I've picked out. The top two will be in my bouquet, and the one on the bottom will be in my bridesmaid's bouquets. All three will appear in the centerpieces. 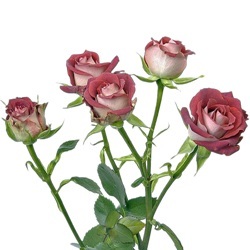 There will also be some spray roses, which have a similar look to garden roses, but they're much smaller. I'm hoping to have those in both dusty rose and peach. 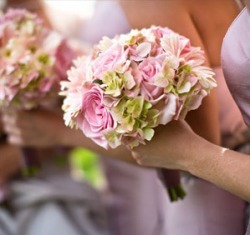 The centerpieces will also have white hydrangea, and the bridesmaid's bouquets will have pink & green hydrangea. My centerpieces are going to be low, but full, flower arrangements in silver pedestal bowls. 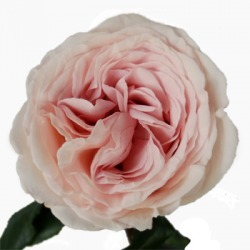 They will have lots of white hydrangea, some sage green greenery, and the above garden roses and spray roses. I think they will be very pretty! 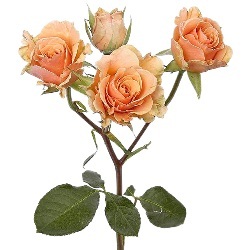 For my bouquet is going to be 30 stems of light pink & peach garden roses. I think it is going to be so lush and beautiful, I can't WAIT to see it! 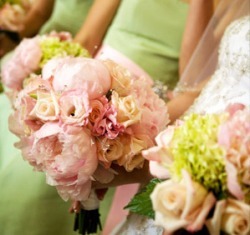 My bridesmaids' bouquets are going to include pink & green hydrangea, the salmon colored garden roses pictured above, and some spray roses. I recently finished my invitations! They were based on this inspiration picture. You can see the finished product and learn how I made them in the DIY section. We're going to have a smallish 3 tier cake that we will supplement with kitchen sheet cake (it's saving us about $100 to do it that way!). It's going to be lemon flavored cake with a delicious berry filling and butter cream frosting. Yum! There's going to be a floral design similar to the one below piped on, and our cake topper is going to be a little pouf of real flowers as seen in the second picture (ivory garden roses and pink spray roses I believe). It should be beautiful! I'm going for a very classic, almost vintage, look with my jewelry. I'm going to make my own bracelet for sure. It will (hopefully) look almost identical to the one below. I probably won't wear a necklace because my dress has so much going on around the neckline, I just think it would be too much. I was going to make my own rhinestone and pearl chandelier earrings to match the bracelet, but I found some at Macy's for $18 that are perfect, so I decided to save myself the trouble and just bought those instead. I plan to wear my hair curly, mostly down but with some pieces pinned back so it's not in my face. For the ceremony, I'm going to wear a fingertip ivory veil. I'm going to try to make it myself, so look for pics coming soon to the DIY section! For the reception, I'm going to ditch the veil and wear a hair flower instead. I'm also going to try to make this myself. 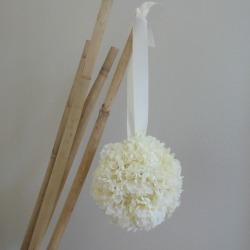 Our flower girls aren't allowed to drop flower peddles on the church aisle, so I'm making them flower balls -- a.k.a. pomanders or kissing balls -- to carry down the aisle. I bought a bunch of ivory-colored silk carnations on ebay so I'll be making them soon! Pictures and instructions will be on my DIY page. I recently finished making my ring bearer pillow, based on the inspiration pics below. Pictures and instructions on my DIY page!